I got me a used iPhone. In playing with it, I installed PCalc Lite, as I am a longtime fan of PCalc (and DragThing, by the same author, James Thomson). I liked it and so I got the full PCalc, which has a lot more features, including a bunch of different themes. Getting into hacking the iPhone, I thought I'd try to make a theme. You can't do this, I suppose, for now, unless you jailbreak the iPhone, as the themes are stored in the app and that breaks Apple's code signature stuff. But the same themes work on PCalc for the Mac, too. So I gave it a shot. 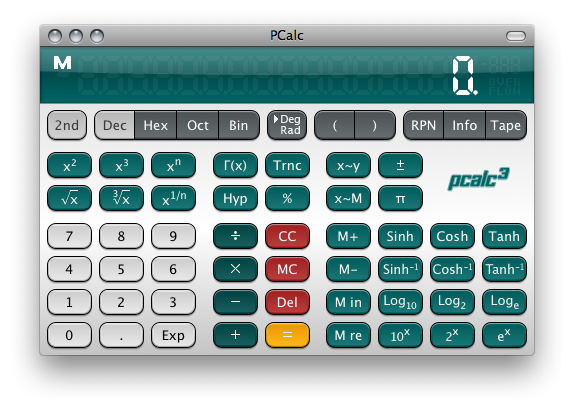 Without further ado, my Slashdot theme for PCalc. You can also download the theme archive itself. Not sure why you'd want to, unless you're me, though. I also have been playing a lot of Quordy and Muddled, two word games from Lonely Star Software. A friend of mine from college wrote Muddled. And I wrote a Perl program that solves both games. Both use a dictionary (I grabbed 'words.sql', a DBLite file, from the Quordy bundle, after uncompressing the ZIP file with the .ipa extension). You just enter the letters you have available to you (in order from left to right, top to bottom for Quordy), pick the dictionary options and the game you're playing, and run it. This page contains a single entry by pudge published on August 19, 2009 3:08 PM. Retarded People was the previous entry in this site. Thoughts On Rhetoric (Mostly in Favor of Democrats) is the next entry in this site.